Five days to go before the Ghacks Christmas Giveaway ends. We have given away lots of licenses to many popular software programs and today's program is no exception to that rule. 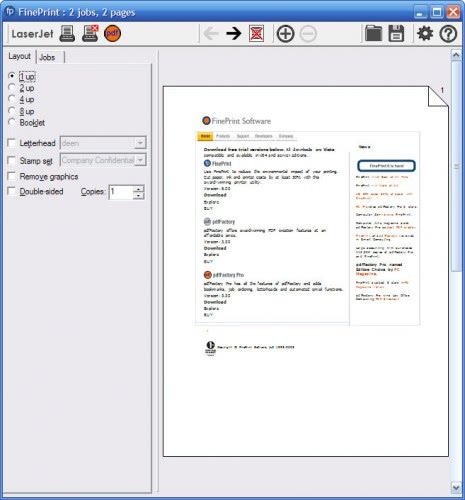 FinePrint is a printing software that can be used to manage print jobs before they are send to an actual printer on the computer system. It is basically a tool to reduce paper and ink usage on a computer system without reducing the quality of the prints. If you regularly print out websites or documents you must have noticed that they do not fit perfectly on paper all the time. Websites are usually to large to fit correctly on paper which will move some elements - usually those on the right side that do not fit on the print - to a second paper. This could leave you with menus that will be printed on their own paper, something that is not normally needed at all. FinePrint offers ways to deal with those pages and a few additional features that make it an interesting software for everyone who prints out those documents regularly. Installation of FinePrint should go through without problems. It adds itself as a virtual printer to the computer system suggesting to the user that it should be set as the default printer on the system. Either way print jobs can then be send to the software application where they will be listed in the main interface. You can send multiple print jobs to FinePrint and the software will display them all in its interface. One of the major features of the software is to remove pages that are not needed in the printout. You can flip through the pages and zoom in on them to find out if a page is needed or not. Pages that are not needed can be removed easily with the click of the button. FinePrint will display the paper savings in the status bar which should give you an indication of its effectiveness. Removing papers from a print job is one thing, combining pages on one paper is another. The printing software can print 1,2,4 or 8 sheets of the print job on a single sheet. It can also print them double-sided if the printer is supporting that feature. Printing 8 pages on one sheet is good for eagle-eye users or archiving purposes. Additional options are available to save computer ink. Graphics can be removed from the printouts and the quality can be set to grayscale to use only black ink when printing. You can define borders, margins and bindings and also add stamps (confidential, proof, internal use etc) to the papers. If the document is ready for printing you can simply send it to one of the connected printers by pressing the printer button in the FinePrint interface. The only thing that is missing is the ability to remove or move objects on a page as well. Other than that is is a great application to save paper. Could be very handy in office or for users who regularly print out websites and other documents. Very nice software package! Great way to save on ink, and paper. I would love to have this great gift.. we would save lots of trees!!! Great software. Would definitely use this everyday. I love this app. It’s just brilliant. Save a lot of paper. At least cut half of the number of trees usually chopped up. Could I get it? This has proven to be a really useful program, saves ink, paper and saves loads of trees! I want one too. Thanks. Finally a program to correctly print websites. Nice to have to print emails and websites and parts of them. I hope to win a license for this one, at least. Until now, no luck. love to save trees with the help of duplex print + fineprint multiup. It would cut down on paper wastage. Sounds fantastic. I’ve always wanted something along these lines. oh … and I figure around 3 trees. I registered my copy of FinePrint 1.25 more than 11 years ago. I would definitely love to win a newer version. Count me in, please. I would like to save as much trees as possible. So the best thing to do, for me, is first off all is cross main fingers and than wish that i win a licence of fineprint. Looks like a ferry good app. Great prog, would like to get it. I will save about 5 trees by day! It should save a tree if I could use it I think. I Could have use for this great program! yeh wooh! Trees! Lots of trees! Yeh!!! I’d love to save some trees here in Italy!! please help me!! Wow Martin, you certainly have nailed the cream of the shareware crop on your giveaway. While fineprint is fantastic and a huge paper / ink saver for its n-up and graphic removal abilities, I think the most overlooked feature is it’s ability to preview a job on screen before you send it to the printer. How many times have you printed a web page or email that has spanned three pages, when the relevant data is only on the first page? FinePrint shows you the print job, and easily allows you to delete individual pages before submitting it to the printer. For those that don’t win, I highly recommend this program! My father prints a lot, this would surely help saving some trees. I am desperately looking for something likethis since InkSaver publisher seems to have gone belly up. Then how many trees ? I’d say I hope to reduce by 25% my paper usage. Now this I could really use. Send it to me ASAP. I have a lot of prints, so this software will make me reducing the costs. looks like a great program. Save tons of paper. The giveaways just keep getting better. Sign me up! I would love to have this software. Thanks. It could be very useful for me! a very green present, may i be so bold to ask for 1? I have used an earlier version of this program. It prooved to be so handy in several occasions. For instance saving a print when working on a computer with no printer connected to print it on another computer. Also printing a booklet was sometimes very neat. And of course, I have saved dozens of trees, because i was able to see if the print output was ok before sending it to the printer. I would love a copy of this program. I never win at these advent comps, but hey, let’s throw my name in the hat for this one! great way to go green! We are printing out a lot so would make a good use of this programme! At the moment I use PDFcreator to archiv all my documents, but Fineprint has more options and better quality. I think I would save at least one or two trees. So it would be great to win one license. Sounds great. I’d like to enter my name for this one. FinePrint is a great program. I highly recommend it. It is going to be a hard winter at the place I live. That’s why, I need to save some trees on printing, in order to make my stove alight for all the winter time. This would save at least a tree a year and countless wasted ink nags I generate from my SO. Been a fan of this program for ages… the book printing method is great and the way it prints is quite ledgible. Add me to the draw on this one… I’d love to start making mini-books for the holidays..
Nice offer, I would really like this one. I would like to save some trees. Nice soft. Whomever gets the license for FinePrint; it is really great software! Great software. Not as many trees as my daughters would save as they go through reams of paper on my printer! Fiddlesticks! Looks like I missed one! I would save at least a hundred trees with my copy, thanks. Would love a copy. The processing options are nice. Great features – Microsoft better hire these guys and make it a default in Windows OS. I intend to save a lot of trees…. This program is very well designed – It remains really unobtrusive until it is required – ie when you print and only then does it automatically appear (if it is the default printer) and that’s when it does it’s magic. Nice blog. Fineprint looks like a helpful utility. It would be great to win and therefore help saving some trees. Lets sava millions of trees. Would love to have a license. I imagine I could save over a thousand trees. I used it in my previous office. Really one of the best program of this kind! FinePrint is a nice program. It’s good for you to print your jobs to a shared printer, since there are chances that someone else may take your printouts away, especially when your printed jobs get embedded into others’ ones. It can allow you to put a banner (e.g., your name on the first, or every page of your printed job), you (of course, other users) can easily find your printed jobs from a stack of paper. However, it does have some shortcomings. Nowadays, more and more scientific journals put some banners (like, where and when you download their PDF file) on each page of a given PDF file. These banners generally run vertically on each page. I’m not sure whether the latest version of FinePrint can handle these banners well. The earlier version can not handle these banners well. For example, it generally prints these vertical banners horizontally that make normal words illegible. It sometimes can handle part of the vertical banners with tightly squeezed fonts. Sometimes, FintPrint can not handle well embeded images in a given PDF file (the images in the preview is OK, but the actual printout is not.). Sometimes, FintPrint converts the English words in a given PDF file to strange characters. If FintPrint can get rid of this shortcomings, it’ll be very useful. Have always wanted to have this. Hopefully, I’ll be lucky this year. Just in time for my 70th Birthday? Wow excellent software. I hope many people will start using softwares like this, which will help our environment and save trees.